Home / How-To + DIY / How to: Chalk Paint® Decorative Paint / How to Stencil a Recessed Furniture Panel: the Easy Way! 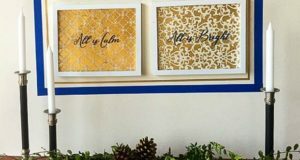 Furniture painting can be a super fun and rewarding project, as well as a great opportunity to incorporate a variety of stencils from Royal Design Studio. Here in our studio, we love transforming inexpensive thrift store recessed furniture finds into little showpieces for our many patterns. 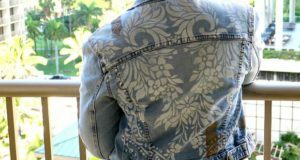 Furniture panels, such as those found on doors or the sides of furniture, are an obvious place to stencil a small allover pattern, but if the area is recessed, it can be challenging to get the pattern to stencil cleanly into the sides and corners. As we were stenciling this small side table recently with patterns from our latest Indian Stencils Collection, we thought we should share the easy way how to stencil the side panels with our Jali Allover Indian Furniture Stencil. The side panel was painted with Chalk Paint® in a custom peacock blue color that was created using 2 parts Provence Chalk Paint to 1 part Napoleonic Blue Chalk Paint. Gold is a perfect color to complement a rich color like this. We mixed custom metallic gold shade by combining 2 parts Bright Gold Stencil Creme with 1 part Antique Gold Stencil Creme. The easiest way to stencil a recessed panel is to simply create a “frame” for it that finishes off the side edges cleanly. This can easily be done with tape! We first measured in a half inch from the edges, marked the lines, applied Painter’s Tape to the outside of the lines and burnished it down. When stenciling an allover stencil pattern in a panel area you will want to center the pattern nicely so that the pattern finishes the same way on each side, and at the top and bottom. A super easy way to find the center of a small square or rectangle is to run your ruler from corner to corner and use it to mark an “x” in the middle. Then, place the center of one of your repeating stencil elements over your center “x”. Stenciling with our Royal Stencil Creme paints is super fast and easy because the paint glides on easily and covers SO well! As you get to the edges of the panel with your stencil, simply push the mylar into the corner and stencil the pattern just over the edge of the tape. Having the tape “frame” there keeps you from having to push the stencil into the very edge. After repeating the stencil all over in the panel, remove the tape and reposition it so that it is now on the inside of the line you drew, covering the area you just stenciled. Add additional tape around the edges of panel to protect the surrounding areas. In this case, it is the pink areas. 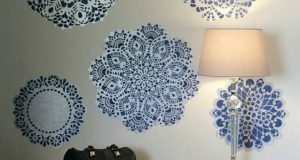 You can paint with Royal Stencil Cremes too! We love the Pointed Sash Brushes for furniture painting, but any good brush will do. Simply paint on a thin layer or two of your gold paint mix using long strokes. 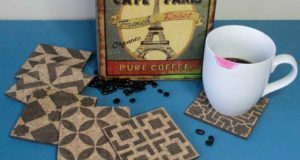 Pull the tape and you have a perfectly stenciled recessed panel: the EASY way! Here’s a peek at the top of the table which features two other Indian Stencil Patterns: Kamal Lotus Flower and a sweet, small border from the Sari Border Series. The Indian Stencils lend themselves to experimenting with bright color combinations. In addition to the lovely peacock blue color, we custom-mixed Chalk Paint® decorative paint to make the pink and orange colors as well. Hi, I log on to your new stuff like every week.Your writing style is awesome, keep it up! Mas, abundantes algo nunca contem esse contribuição.